It’s the moment that many Lehigh Valley beer lovers have been waiting for: Two Rivers Brewing Company in Easton has finally brewed their first batch of beer. Co-owner Troy Reynard told us that their first brew day was March 26th and we got a sneak preview at the beers that we can expect from the crew once they’re ready to pour. The first beer they brewed was their Getters Island Pale Ale and it should be ready in three to four weeks. The brewery has gone through many struggles since their 2012 opening in their attempts to transform from bar to brewpub, including structural issues and equipment problems. Their brewing equipment was finally moved in earlier this year, allowing for testing and calibration before the first beers were brewed. Pine St. Blonde- Belgain Blonde 5.2%- Golden color, lightly spiced with hints of coriander, peppercorn, and citrus. Moderately carbonated with malty sweetness up front and has a dry finish. Named after the ladies who plied their trade on Pine Street, Easton’s “Red Light” District during Prohibition. Bankers Brown- American Brown Ale 5% ABV- This brown ale has chocolate caramel-like notes as well as hints of roasted coffee. The low hop aroma and bitterness complements the roasted characteristics of this classic American beer. When we met with our banker the first time to present our business plan, we told him if we got the loan, we’d name a beer after him. Here’s to you Jim! Getters Island Pale Ale -American Pale Ale 5.4% ABV This pale ale has a deep golden to copper color with hints of pilsner and caramel malt. It is balanced out with a pleasant floral and citrus aroma. It has a moderately dry, clean crisp finish. Named after the little island North of the toll bridge between Easton and Phillipsburg named after Charles Getter, convicted of murdering his wife in 1833. Getter was hanged on the island twice for his crime, the rope broke on the first try. We named the pale ale after Getter’s Island, because old Charlie must have been pretty bitter for the thirty minutes it took for them to get another rope. Colonel Left Eye IPA- India Pale Ale 5.6% ABV This deep in copper color IPA has a malty body and a moderately high hop bitterness with hints of pine and herbal characteristics to balance out the sweetness from the malt. This beer has a nice dry finish. Our IPA bears the moniker of another bitter Eastonian, as it was Eastonian and Lafayette College grad Colonel Charles Wikoff who lost his life leading the charge up San Juan Hill, an action generally attributed to Teddy Roosevelt. Mt. Vernon Lager- Pre-Prohibition Lager 4.6% ABV- This light in color, light in body pilsner has a delicate malt and hop profile. It has a clean, and crisp finish and is highly carbonated to bring out the delicate aromas from the malt and hops. This beer bears the historical name of the building it’s brewed in. 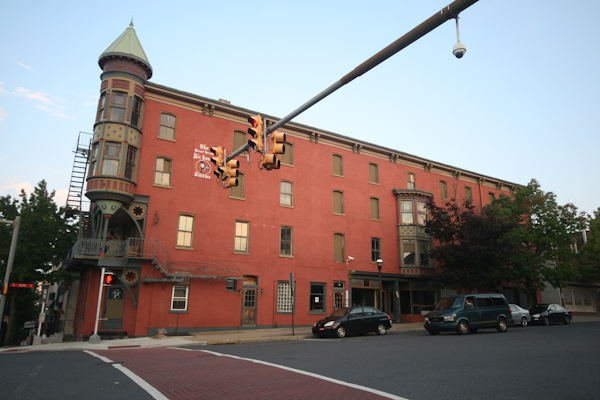 Prior to being the site of Two Rivers Brewing Company, the building was known as the Mount Vernon Hotel. The brewery also has two other beers registered with the state, Danny Mann Irish Stout and Easton Assassinator Doppelbock, but it’s unclear whether those beers will make it to the brewpub any time soon. We’ll keep you updated as Two Rivers prepares to tap their first in-house beers.